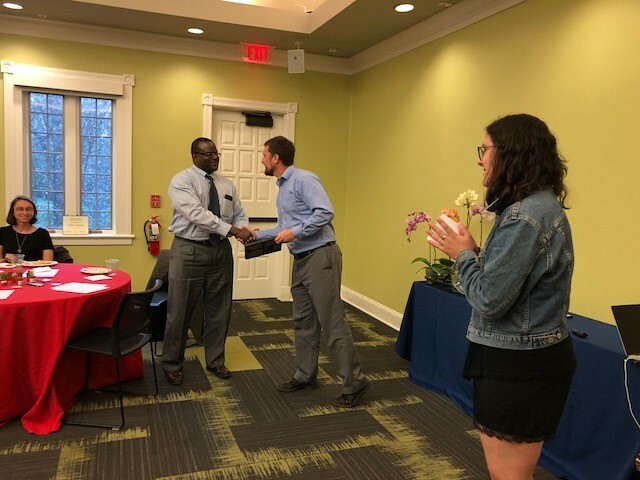 Each year the Office for Sustainability and leaders of campus sustainability groups host a Sustainability Banquet to reflect on the year's accomplishments and to recognize University of Richmond community members for their outstanding contributions to sustainability. Sustainability leaders are nominated by their peers and at the dinner, Sustainability Leadership Awards are presented. Harleen Bal, '18, was recognized for her ability to spearhead change and elevate conversations about sustainability. She has a unique ability to foster engaged, polite discussion on sensitive environmental issues. She is a leader, a do-er, a supporter, and a listener who uses her creativity, compassion, and curiosity to lift up people around her. 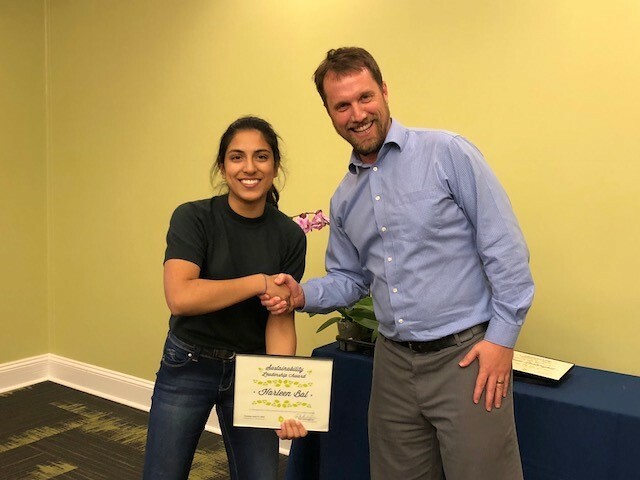 Alexis Szepesy, '19, received an award for her active role in the analysis of state and federal water policy documents, work with the Sierra Club, and support of the Governor’s Virginia Advisory Council on Environmental Justice. She was instrumental in the success of the Riverfront UR project, and has been called an inspiration by her peers who is sure to make an impact with whatever she works on next. Dr. Todd Lookingbill, Associate Professor of Biology and Associate Professor of Geography and the Environment, was recognized for his exceptional teaching, scientific expertise, and leadership by example. His students have been his co-authors and worked alongside him as field researchers on campus and in national parks. In only eight years, he supervised 34 students on 44 undergraduate student research projects and brought more than $1,000,000 into the University. Todd walks the talk and invites you to join him on the journey. James Campbell, Custodial Supervisor, received an award for his tireless efforts to steward recycling on campus during the University's first Rethink Waste football game and the rollout of Rethink Waste efforts across campus. He is a compassionate leader who puts his team’s needs before his own and is quickly becoming the face of the Rethink Waste effort. Abby Houser, a staff member, received an award for her crucial role in organizing the University's first ever RecycleMania basketball game. This game was part of the RecycleMania competition. 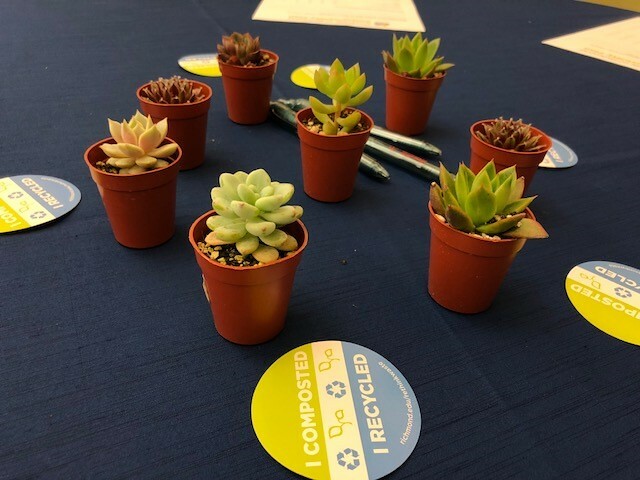 87% of the waste from the game was composted or recycled and only 13% went to the landfill. Diana Nguyen, a student, was recognized for her leadership of Spiders CARE, UR's first animal rights group. She helped bring together an amazing, dedicated group of people and worked hard to educate her peers through events, digital media, and in person interactions. Joanne Kong, a faculty member, was given an award for her work to raise awareness of, educate about, and inspire action towards a plant-based diet. Donald Edmonds, a student, was recognized for his involvement in the Office for Sustainability, Earth Lodge, and SEEDS. Fellow students and faculty in the Geography and Environmental Studies departments also praised his dependability, creativity, and leadership. Mary Finley-Brook, a faculty member, received an award for her work with Green Schools and her work as an activist, educator, and social scientist. She has long been a cornerstone of sustainability at the University and has worked with dozens of students on sustainability issues on campus and abroad. David Donaldson, Operations & Summer Programs Coordinator in Events, Conferences, & Support Services, has been a longtime sustainability leader on campus. He was recognized for his management of the community garden, leadership in URSA, spearheading the zero waste graduation, and his work on green events. Kristine Grayson, Assistant Professor of Biology, was recognized for her work on the 2016 Power Dialog, her sustainability and environmental research with students in an Environmental Studies capstone course, her summer and lab research with Biology students, and her role on the Environmental Studies advisory committee. Two students were also awarded Sustainability Leadership certificates. Maggie Johnson was recognized for her role as the founding President of Food Recovery Network at the University of Richmond. Peter Tight was recognized for his work with the paper towel composting project in Puryear Hall.